We wanted to quickly highlight some recent buying and selling activity on our part. On a personal level, and as we reported here, we bought and then sold the new Global Partners 9.75% fixed-to-floating preferred (NYSE:GLP-A) which we had bought on the OTC Grey market during the IPO. We had purchased these shares at $24.82 and as it rose by darned near a dollar in the next 10 days a Good Til Cancelled sell order was submitted at $25.90. In this case we would have moved the GTC a bit higher, but we were vacationing on an island in Lake Superior and had darned little cell coverage and the issue hit our mark. We had believed the sell could have been too early as the share price continued to rise to $26.25, but it has now settled back to $25.90’s. If the issue would settle down by 25 cents from here we would be tempted to get back in the issue. We actually think the current share price is primarily a result of the issue being priced incorrectly and that with dividend accrual over the next 2 months we could see a share price of $26.60 prior to ex-dividend date around November 1. Additionally we picked up a larger position in the new Gladstone Investment 6.375% term preferred (NASDAQ:GAINL) with an initial purchase of 500 shares at $24.70 and a 300 share add on to our position at $25.10. Needless to say the current share price of $25.38 is very pleasing to us–although we were more pleased that this issue ever sold for $24.70. Lastly we made a modest purchase of the new Saratoga Investment 6.25% baby bond (NYSE:SAF). We had to pay $24.98 for these shares, which was a bit higher than we anticipated, but obviously there was good demand as shares have now raced to $25.27. Note that we will be adding 200 shares at $24.98 to the Medium Duration Income Portfolio (not added yet). Further portfolio changes (models and personal) were the loss of the Gladstone Investment 6.50% and 6.75% issues to redemption and we had chosen to sell the 6.25% (GAINM) issue (after capturing the August dividend) as we believe it will be announced for redemption next month. Obviously with the large positions we held in the Gladstone Investment issues we are left with a large personal cash position which we will need to deploy soon–always a challenge. After thoughtful consideration we have exited our sizable personal position (around 1000 shares) of the Gladstone Investment 6.25% Term Preferred shares (NASDAQ:GAINM). Investors are aware that GAIN recently called for redemption of their 6.50% (GAINN) and 6.75% (GAINO) term preferreds for 8/31. The company did this through the issuance of a 6.375% term preferred issue (NASDAQ:GAINL). The company (a business development company) did this because both issues required asset coverage ratios of 200% and with law changes and a board of directors vote the company will be only required to have a 150% asset coverage ratio of senior securities effective on April 10, 2019. While we don’t agree with reductions in asset coverage ratios as this will raise our risk when the economy softens, but it is what it is and we have to make the best of it. Why did we exit the GAINM issue? Simply because it contains the same terms as the GAINO and GAINN requiring 200% asset coverage ratio and it makes no sense to redeem the other 2 issues and not redeem the 3rd issue since the singular issue outstanding would require the maintenance of the higher asset coverage ratio. Additionally we have captured the August dividend as well as 2 more dividends by selling in the $25.25 area. This issue becomes redeemable on September 30, 2018 (in 1 month) and we believe they may well call it for that date meaning only 1 addition dividend (a monthly dividend) will be paid. Investors should be aware that they have the time frame of 9/30/18 until 4/10/2019 to redeem the shares and still be able to apply the lowered leverage ration, but with rates highly probable to rise in the months ahead we think they will want to get this done sooner rather than later. Will they redeem a 6.25% issue by issuing a 6.375% issue? We think this is not a very relevant issue. The increase in dividend cost is virtually nothing at all–we are talking $65,000 annually on a $50,000,000 issue (2 million or so shares). The increment leverage available to the company will have ‘earning power’ of over 100 times (or some such huge number) the increased dividend cost. Will the company issue more preferred stock for this redemption? Probably will eventually but the company has had no problem raising money with stock sales and they have just raised their revolver to $200,000,000 which may be expanded to $300,000,000 (as seen here) and they only had $102 million outstanding on the revolver on 6/30 so raising money will be no issue whatsoever. 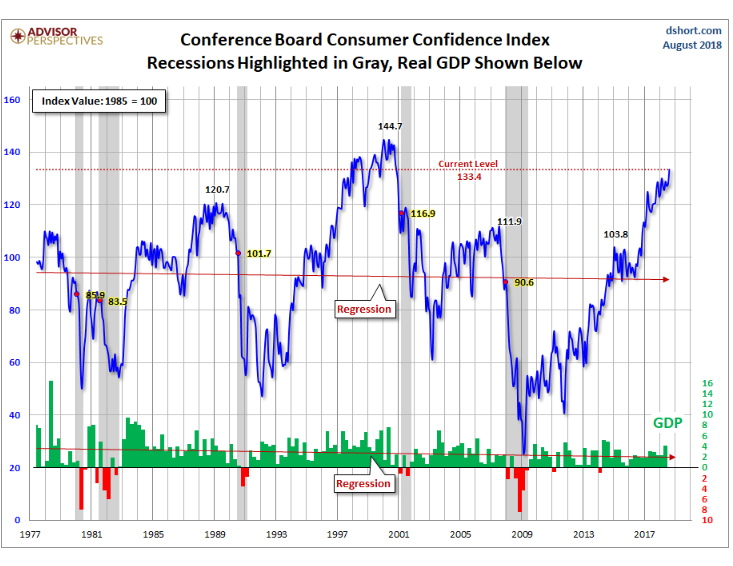 So everyone knows by now that Consumer Confidence (as measured by the Conference Board) moved strongerly higher in August with a reading of 13.4, which is the highest reading since October, 2000. On Monday we had written “For the coming week we have Consumer Confidence being released on Tuesday and while this is unlikely to garner much attention any sizable shortfall to last month (127.4) could be meaningful as the consumer drives the economy and any failure in confidence could send consumer spending down hard”. Obviously there is no confidence problem and outside of a ‘black swan’ event we likely will have a decent economy through the balance of the year. Today with the release of the strong confidence numbers we got one of the few upticks we have seen lately in the 10 year treasury yield with a a bump up to 2.88%–just over 3 basis points higher on the day. This is not meaningful to investors and share prices remained flat. You can see in the current chart below of current confidence trends that after flattening for a few months confidence ‘falls off a cliff’ just as we enter a recession. I think we can rest assured that we will not see a recession anytime soon. So there are a few coincident indicators we watch-1 important one, is the level of consumer credit which could be spiking higher with rising confidence. To us this simply means that the more debt (in particular credit card debt) that the consumer takes on the deeper the next recession will be. Here is a chart from the Fed Reserve Bank of New York showing current (though the end of Q2) levels of household debt. 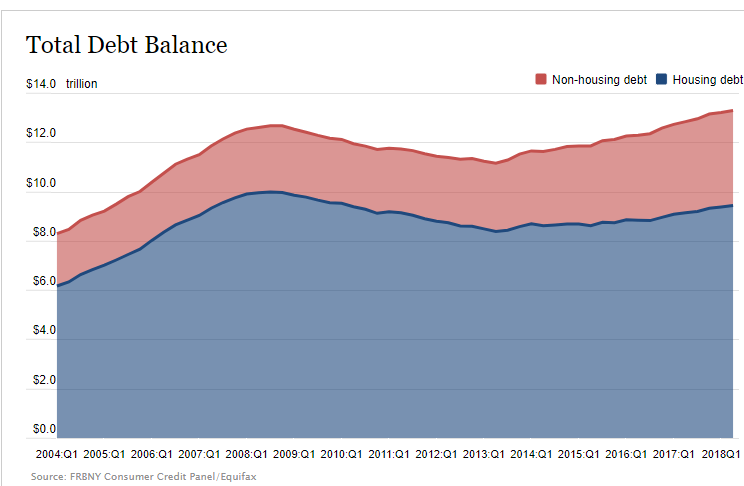 It is a bit hard to read, but what it shows is that the non housing debt of the consumer is now at $3.86 Trillion and it had previously peaked at $2.69 Trillion is 2008. I will be watching the next few months and quarters to see where this heads—I think it is reasonable to assume we will see large jumps in these numbers ahead as consumers choose to believe that the party will go on forever–it won’t–but it will for the next few months. At any given time we are watching bunches of different markets which we seldom write about because they simply don’t have current effects on various income securities that we watch day to day. Recently we have been watching natural gas prices. Obviously most readers are aware that the United States has become the globes largest producer of natural gas because of horizontal drilling in the various shale plays. Because of the huge increase in natural gas the U.S. has become, for the 1st time in 60 years, a net exporter of natural gas. Just in the last 2 years natural gas exports of LNG (liquified natural gas) has risen by over 400% to the point where the amount of natural gas that the U.S. has in storage has begun to get smaller and smaller. It is this buffer in storage that allows the U.S. to supply domestic needs during very cold–or very hot weather as the amount of power generated by natural gas power plants increases (from coal). 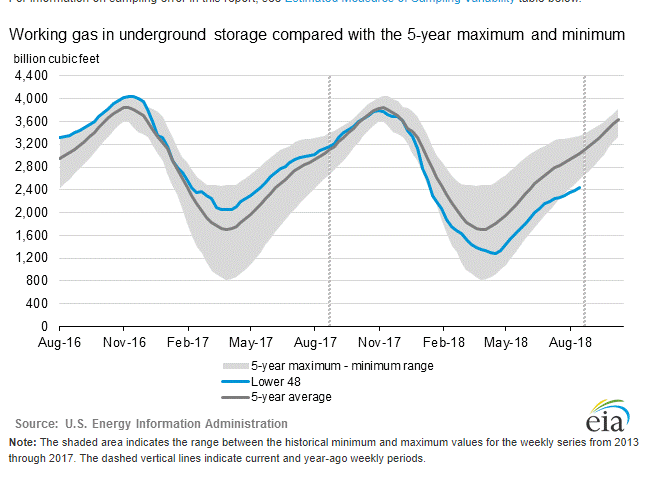 Here you can see a chart from the Energy Information Agency which shows that current natural gas inventories are running around 25% to 30% below the 5 year average and now have moved to the lowest level, for this time, in 5 years. Now is when U.S. natural gas should be injecting (stored) in preparation for winter needs, but we have a new player–LNG and global markets which stand ready to purchase most any amount the U.S. wants to sell. Now it is not our intent to write a big long article on natural gas–but it is our intent to highlight a potential pitfall or maybe opportunity in the various MLPs available to income investors. We are talking about the pipeline companies, natural gas producers and the LNG shippers (like Dynagas LNG Partners, Teekay LNG Partners or GasLog Partners) which may stand to either benefit from or get hurt by quickly changing markets. The point of this article is simply to give a ‘heads up’ for holders or potential holders of securities in the natural gas arena. So we are moving past the dog days of summer and after very little movement in any particular marketplace last week we expect things to heat up a bit in the coming weeks as political and fiscal issues begin to take the stage. Of course everyone probably notices that the Turkey “situation” has essentially disappeared from the news–as usual the media and thus investors are on to other interests. One of those interests is a potential trade deal with Mexico–and then Canada afterwards. We do not try to analyze such items as the amount of time required is way beyond our availability, but we certainly will watch for affects on equity and interest rate markets. The DJIA traded in a range of about 25,600 to almost 25,900 before closing the week at around 25,800. The 10 year treasury barely moved during he week as it moved in a range of 2.81% to 2.85% closing the week at 2.83%. As we quickly scan the economic news releases last week we see only a single stat that was stronger than ‘consensus’. Existing home sales and New homes sales both came in weaker than consensus and weaker than the previous month. The flash number for the Purchasing Managers Index for services and manufacturing both came in below the previous month. Durable Goods orders were very much weaker than last month, while only the Capital Goods orders was stronger than consensus and last month. For the coming week we have Consumer Confidence being released on Tuesday and while this is unlikely to garner much attention any sizable shortfall to last month (127.4) could be meaningful as the consumer drives the economy and any failure in confidence could send consumer spending down hard. On Wednesday we get the 1st revision on the 2nd quarter GDP–one might think it will be important–but it isn’t since we have a 4.1% growth already announced these revisions are minor tweaks and no one will be paying much attention to the number. Thursday has personal income and personal spending–both unlikely to be meaningful–or at least paid attention to by most. Friday we have the Chicago Purchasing Manager Index and Consumer Sentiment–no one cares much what these indicators say as standalone numbers–but taken in conjunction we other indicators they certainly have meaning. With the weak numbers all around released last week if this continues we are going to see further flattening of the yield curve as the Fed moves to raise rates next month while the economically sensitive 10 year treasury will remain pegged in the 2.80’s% (or even lower). The Fed balance sheet was totally flat last week following the drop of $30 billion runoff of the week before. Last week we had just 1 new income issue announced and that was the Saratoga Investment (NYSE:SAR) 6.25% baby bonds due in 2025. The pricing term sheet can be found here.This new issue should begin trading today under the permanent ticker of SAF. Last week we had the average $25 preferred stock move up by 4 cents while the number of available issues for $25 or less is at 158 issues–which is where it has pretty much been stuck for months. Obviously with the dog days of August and little movement in interest rates it makes sense that prices are very stable–certainly subject to change during the balance of the year. We love summer–the heat is something I have learned to love. In my younger years I hated–absolutely hated the heat of summer, but as one grows older the heat is much less “hot”. It used to be my wife loved the heat of summer–I would turn the air conditioning down to 68 degrees and she would turn it up–now she has hot flashes and she turns the air conditioning down and I turn it up. Investing for me is something I absolutely love, and this has always been true, but over the years all of the factors that go into investing change. I wish as a younger person I would have had the wisdom and the patience that I have now–with the benefit of 20/20 hindsight we would all be very wealthy indeed. We can tell the ‘dog days of summer’ have been truly upon us as only 1 income issue (in our universe) has been announced this week (Saratoga Investment). The 10 year treasury has barely moved all week long and even the DJIA has moved in less than a 1% range. We also note that REITs have not been issuing $25/share preferred stocks. The last issue that was sold was in March, 2018–almost 6 months ago. REITs have historically been huge issuers of preferreds (less than banks, but still huge). I have noted many, many issues of REIT common shares coming to market so they continue to access capital–just in a different way. Also many of them had sold preferred stocks in “refinancing” transactions (redeeming older high coupon issues and replacing with ultra low coupon issues) and it is likely they have refinanced all of the older preferred issues that were outstanding. So as we coast out of summer we are certain that the markets will be plenty exciting in the fall as we will see a FED rate increase in September, which will minimally give us more return on our ‘cash’ holdings. Of course we will have elections in November which will very possibly change the political landscape of the country which will add plenty of excitement. We continually, as a nation, are faced with massive deficit spending and at some point this comes home to roost–will it be this year–or will it be 5 years or 10 years from now? While business development company, Saratoga Investment Corp (NYSE:SAR), hasn’t updated their latest investor presentation we have just quickly reviewed the slides from their July presentation and are impressed by the growth and profitability of the company. We are noting this because SAR currently has a baby bond out standing and they have just sold a new 6.25% baby bond issue which is covered in postings further down this page. Here is a bit of a recap page from the presentation showing the good progress the company has made in the last 3 1/2 years. The balance of the presentation can be found here. The new baby bonds which Prudential Financial (NYSE:PRU) priced on 8/7/2018 are now finally trading. The issue is trading under the ticker PRS and last traded at $24.95. The issue has a coupon of 5.625% and being a debt issue the interest payments are not qualified payments for tax purposes. The issue is investment grade with S&P having the bonds at BBB+ and Moodys having them at Baa2. This was a fairly huge issue with $500,000,000 being issued with another $75,000,000 allowed for over allotments–a total of 23,000,000 baby bonds being sold. The bonds do not mature until 2058, but have an early redemption available starting in 2023. The offering documents are here. We note that PRU has 2 other baby bond issues outstanding. PJH has a coupon of 5.70% and became callable in December 2017–currently trading at $25.44. PJH has a coupon of 5.75% and is trading at $25.55 and has been callable since 3/2018. We currently have no interest in the bonds primarily because of the long dated maturities. Business development company Saratoga Investment Corp. (NYSE:SAR) has priced their new baby bonds with a coupon of 6.25%–a bit disappointing to us, but it seems we are always disappointed–we always want more. We will have to let the marketplace speak as to the pricing. We suspect the bonds will have plenty of demand as it is a smaller issue of 1,400,000 shares with another 200,000 reserved for overallotment, but likely will have a limited upside to the price once trading commences. The new bonds will trade on the NYSE with a permanent ticker of SAF. There will not be trading on the OTC Grey market of this issue prior to permanent trading on the NYSE. The new notes will have a maturity date of 8/31/2025. The normal terms apply–quarterly payments, non qualified interest will be paid and an early redemption period beginning 8/31/2021. Saratoga Investment currently has 1 other baby bonds outstanding and the information on that particular issue (which carries a 6.75% coupon) can be found here. Even though we are not impressed with the coupon on this issue we may well take a small 200 share position in the Medium Duration Income Portfolio which has about a 7% cash position so could invest with cash on hand. Saratoga Investment (NYSE:SAR), a business development company, will be selling new $25 notes with a maturity in 2025. The notes which are not yet priced will trade on the NYSE under ticker SAF in the next 30 days. The company currently has a 6.75% issue outstanding (NYSE:SAB) which is not redeemable for another 16 months and is trading at $25.84 right now. Our end of year forecast for the 10 year treasury to close the year at 3.25% is looking more and more to be too high. It is interesting that no matter what the economic news is rates either hold steady or fall. We checked and saw the FED let $30 billion run off the balance sheet last week so with reduced FED demand other global buyers are stepping up to buy the treasury paper. It is amazing to me that global buyers are continuing to buy U.S. bonds for the ‘safety’. It is scary to think that the U.S. is the best risk in a world–but it is what it is. One day–someday–all of this will come home to roost. In spite of a pretty good economy the U.S. ran a deficit of about $80 billion in July alone–with corporate taxes being $55 billion lower than a year ago July. Projections are for over a trillion in deficits for each of the next couple of years. Our progress toward becoming ‘Greece’ continues. REMEMBER–deficits don’t matter to bond buyers–UNTIL THEY DO. No bells or whistles will sound — it will just happen. We will go to bed with the 10 year treasury at 2.9% and wake up and find it at 3.5% and panic will ensue. As we opened an account today we noted Gladstand Land Preferred (NASDAQ:LANDP) traded at $27.95. Our guess is someone put in a market order for the 195 shares and paid a heavy price for the error. Just a reminder not to accidently use a ‘market’ order instead of a ‘limit’ order. Nothing to write today as I have been out of the office for 4 days and arrived back to the office at 9 last night. I need to figure out what is happening in the markets etc before writing so hopefully as the day goes by I will bet in tune. The one items that reader Nomad noted our Global Partners 9.75% f-t-f got sold last week as the shares hit 25.99 and executed our good til cancelled order at 25.90. Likely we would have moved this gtc order higher if we would have been in civilization–but we were out of cell phone range with limited access to internet as well. Oh well we will watch to see if there is a potential re-entry in the days ahead. We will be out of the office the majority of the time during Thursday and Friday, although we will be back in the evening to check out the markets. Of course we will have our smart phone with which to keep an eye on all of the fun in the marketplace, but attempting to update the website with the smart phone is beyond our patience. We will mention that we moved our good-til-cancelled sell order higher on the Global Partners 9.75% f-t-f preferred. After vacillating whether the issue might be a quick flip in the $25.49 area we have watched the issue go higher to close at $25.64 Wednesday. Our original Good til Cancelled order was at $25.75 so we cancelled and reestablished at $25.90–for now. For now this has been a great issue which we truly have believed, since the date of issuance, was very mispriced–oh well. As the situation in Turkey keeps simmering global investors do the ‘rush to safety’ move once again sending the 10 year treasury down -4 basis point to around 2.85%. As I glance at the Master List of $25 issues it appears that the safety play has probably moved share prices up by a few pennies–I know for sure it has had little to no impact on our personal holdings. Obviously equity holders have been sellers today with the DJIA off 280 as I write–but of course this is nothing–we will worry when the DJIA falls 750-1000 points because at that point in time the evening news and mainstream media play it as a disaster. Small players who have bought at high levels now sell at low levels and head for the cave in the backyard. This is why the average retail investor earns 2.5% annually–instead of the much larger amount they brag about. Remember that preferred stock and baby bond holders will not likely be hurt in a stock market tumble until we reach the point of pure panic and investors rush to toss the baby out with the bath water.